The three-volume Basics of Addiction Counseling Desk Reference covers essential addiction education in pharmacology, ethics, and counseling skills, theories and practices. The Basics of Addiction Counseling Desk Reference is a three-volume set that has aided many addiction professionals in attaining their state and national credentials. Beyond this, the Desk Reference is used as a quick reference tool for various situations that arise throughout addiction professional careers, and as a college/university text for classes such as Addiction 101, Addiction Overview, and other addiction-related course work. Updated in late 2017, Module I: Pharmacology of Psychoactive Substance Use Disorders is designed to introduce addiction, behavioral health and other service providers to the pharmacology of psychoactive substances and to increase their familiarity with the signs and symptoms of psychoactive substance use. Application of effective counseling techniques must contain factual information on the various types of psychoactive substance used that may lead to dependence, and their effects on the human body physiologically, psychologically and emotionally. This Module highlights the most recent science related to psychoactive substance use, including appropriate terminology and conceptual frameworks. 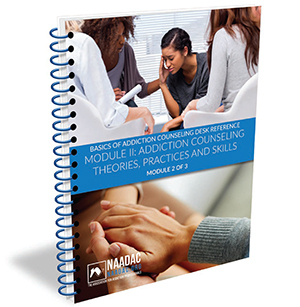 Updated in late 2017, Module II: Addiction Counseling Theories, Practices and Skills is designed to provide addiction counselors and other helping professionals with a general overview of the major theories and techniques used for addiction counseling. To be effective, addiction counselors and other helping professionals require concrete methods for correctly assessing clients and conceptualizing the problems associated with each individual. With a strong theoretical base, addiction professionals can more accurately determine the needs of their clients and outline possible directions for treatment. Updated to reflect the new 2016 NAADAC/NCC AP Code of Ethics, Module III: Ethical and Professional Issues in Addiction Counseling is designed as a teaching tool to assist addiction professionals in maintaining ethical professional practice. This manual contains a detailed discussion of the nine principles of the NAADAC/NCC AP Code of Ethics, as well as models for ethical decision making. In addition, examples of unethical conduct, possible applications of the NAADAC/NCC AP Code of Ethics and reflection questions are included in each chapter to further enhance the proper application of ethics in the addiction profession. This package includes the independent study courses for each of the three Basics of Addiction Counseling Desk Reference modules, including all three manuals and access to the online independent study exams for each module that can be completed for a total of 29.75 nationally-approved continuing education hours (CEs) and serve as useful practice for certification/licensure exams. This package includes the manuals for each of the three Basics of Addiction Counseling Desk Reference modules. This package does NOT include access to the online exams for each module that can be completed for CEs. The purpose of the Desk Reference is to provide a compendium of material for the addiction and other helping professions that offers a general overview of information necessary to the development of a well-rounded addiction and other helping professional. The Desk Reference is intended to orient an individual program of study, which encompasses additional research and investigation. The Desk Reference is not purported to be either all-inclusive or in sufficient detail to ensure success in actual certification/licensure examinations. It MUST be used in conjunction with the examination content outline provided in application materials and the bibliography provided in the Desk Reference modules. While training courses based solely on the content of this manual should be professionally helpful, they may or may not, by themselves, adequately prepare one for success in actual certification/licensure examinations. Newly updated, Module I: Pharmacology of Psychoactive Substance Use Disorders is designed to introduce addiction, behavioral health and other service providers to the pharmacology of psychoactive substances and to increase their familiarity with the signs and symptoms of psychoactive substance use. Application of effective counseling techniques must contain factual information on the various types of psychoactive substance used that may lead to dependence, and their effects on the human body physiologically, psychologically and emotionally. This Module highlights the most recent science related to psychoactive substance use, including appropriate terminology and conceptual frameworks. 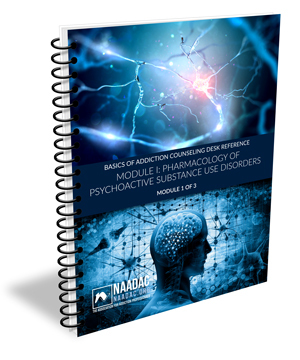 Before pharmacology can be explored, it is important for addiction counselors, behavioral health counselors and other service providers to understand the direct connection between psychoactive substance use, impairment and substance use disorders including dependence. A substance use disorder is understood to be the use of any substance that goes beyond what is recommended, prescribed, or legal. Addiction is understood to be a disease that dysregulates the normal functioning of the brain, primarily evidenced by obsessive thinking patterns, compulsive drug seeking, lack of impulse control, and mood disorders. Substance use disorders develop when psychoactive substances are consumed to the point that the brain must readjust its normal functioning to compensate for the continual presence of the substances. The threshold for the amount of psychoactive substance that an individual must consume to become dependent is highly individualized, based on genetics, brain chemistry, specific substance, trauma history, and environment. Understanding the effects of psychoactive substances on the human body and the variables that can lead a person towards a substance use disorder will allow an addiction counselor, other helping professionals and service providers to more effectively work with their clients. This independent study course includes a 246-page manual and access to a 110 question online exam that can be completed for 11 nationally-approved continuing education hours and serve as useful practice for certification/licensure exams. This purchase includes the 246-page manual only. It does NOT include access to the online exam that can be completed for CEs. 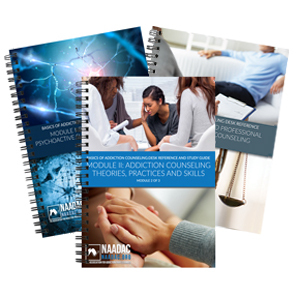 Newly updated in 2017, Module II: Addiction Counseling Theories, Practices and Skills is designed to provide addiction counselors and other helping professionals with a thorough overview of the major theories and techniques used for addiction counseling. To be effective, addiction counselors and other helping professionals require concrete methods for correctly assessing clients and conceptualizing the problems associated with each individual. With a strong theoretical base, addiction professionals can more accurately determine the needs of their clients and outline possible directions for treatment. Module II: Addiction Counseling Theories, Practices and Skills discusses the main theories and techniques used during each type of counseling dynamic, such as individual, family or group therapy. Within each of these settings, there are many different counseling theories practiced by addiction professionals; however, no one therapy or counseling approach is appropriate for all situations or clients. Depending on the school of thought of the addiction counselor or other helping professional, several theories could be equally applicable to a given situation or client. An addiction counselor or other helping professional must utilize his or her own experience and education to gauge which therapeutic approach would be the most beneficial and effective for the individual client. This part of counseling is often referred to as the “theoretical tool bag” because addiction professionals simply look for and select the best “tools” for the job at hand. DSM-5 diagnostic criteria & newest ASAM criteria. 2016 NAADAC/NCC AP Code of Ethics. Support of evidence-based practice and theory by research. published since last edition. This independent study course includes a 168-page manual and access to an online exam that can be completed for 7.75 nationally-approved continuing education hours and serve as useful practice for certification/licensure exams. This purchase includes the 168-page manual only. It does NOT include access to the online exam that can be completed for CEs. 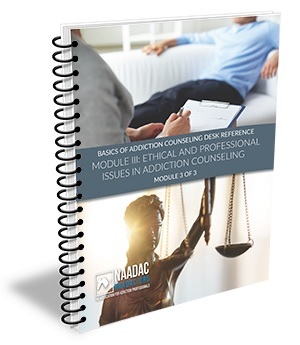 Based on the NAADAC/NCC AP Code of Ethics, Module III: Ethical and Professional Issues in Addiction Counseling is designed as a teaching tool to assist addiction professionals in maintaining ethical professional practice. This manual contains a detailed discussion of the nine principles of the NAADAC/NCC AP Code of Ethics, as well as models for ethical decision making. 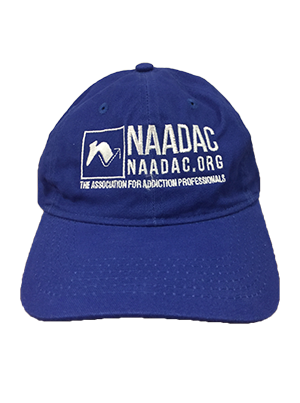 In addition, examples of unethical conduct, possible applications of the NAADAC/NCC AP Code of Ethics and reflection questions are included in each chapter to further enhance the proper application of ethics in the addiction profession. The 2016 NAADAC/NCC AP Code of Ethics is a general guideline for professional behavior. In working with clients, colleagues and treatment agencies, there are events that occur which may not be specifically covered in the NAADAC/NCC AP Code of Ethics. Therefore, this manual is not intended to be an exhaustive resource concerning ethics, professional conduct or the addiction profession. Addiction professionals are encouraged to seek out additional resources concerning ethics and professional conduct when confronted with a questionable ethical situation. Persons who use this manual when making ethical decisions are acting on their own and not under the advisement of NAADAC. 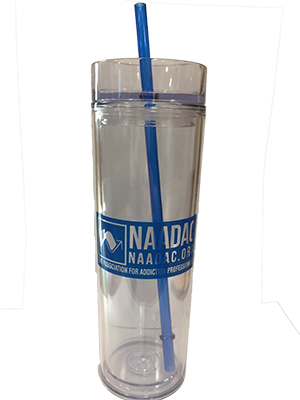 NAADAC is not responsible for the competency, actions or ethical behavior that results from reading this manual. Further, the examples provided in the guide are for illustration only and are not definitive statements of NAADAC’s ethical policies or guidelines. This independent study course includes a 130-page manual and access to an online exam that can be completed for 11 nationally-approved continuing education hours and serve as useful practice for certification/licensure exams. This purchase includes the 130-page manual only. It does NOT include access to the online exam that can be completed for CEs. Integrating Treatment for Co-occurring Disorders: An Introduction to What Every Addiction Counselor Needs to Know is a skill-based training manual that will help addiction counselors improve their ability to assist clients who have co-occurring disorders, within their scope of practice. 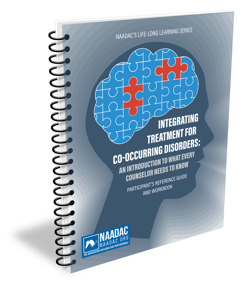 This introductory educational manual is designed for those who do not have a significant background with co-occurring disorders and provides information on understanding, referring, and treating individuals who have co-occurring disorders. The manual dispels many myths related to mental illness treatment and the consequential barriers to effective assessment and care of those diagnosed with co-occurring disorders. Also addressed are commonly encountered mental disorders, DSM-5 diagnostic criteria, applicable screening and assessment instruments, issues surrounding medication management, and coordinating with other mental health professionals. This manual will also introduce the integrated model of mental health and addiction treatment services, outlining bet practices for the treatment of co-occurring disorders. Through the use of case studies and interactive exercises, participants will feel more comfortable and competent in addressing mental health issues with clients who have co-occurring disorders. Explore common misperceptions and biases regarding co-occurring disorders. Recognize and screen for the most frequent co-occurring disorders seen in a substance use disorder treatment setting. Apply knowledge of evidence-based practices currently utilized in the substance use disorder arena to treating clients with co-occurring disorders. Integrate substance use disorder and mental health referral services within the scope of his or her own practice. Identify a client’s stage of change, and stage of treatment, to implement effective interventions. Discuss the clinical aspects of medication management for co-occurring disorders. Review and discuss case studies and strategies for ensuring successful client outcomes. Translate information presented to clients, families, colleagues and the community. This independent study course includes the 160-page manual and access to an 80-question online exam that can be completed for 8 nationally approved continuing education hours (CEs). This purchase includes the 160-page manual only. It does NOT include access to an online exam that can be completed for CEs. The Conflict Resolution for Recovery and Relapse Prevention (CRR) Training Kit is a skill-based therapeutic training program focused on the brain, how it works in conflict, and how to affect the quality of recovery. The Training Kit consists of a Facilitator’s Guide, Participant’s Guide, and a CD-ROM. The Facilitator’s Guide and Participant’s Guide may be purchased separately. Help reduce relapse and sustain recovery of adult and adolescent substance use, abuse and dependent persons by improving their conflict resolution knowledge, attitudes and skills. Serve as a research-based, empirically-tested, psycho-educational curriculum that is effective and appropriate to use with diverse populations of adult and adolescent substance use disorder persons. Provide treatment and training materials for professionals (counselors, social workers, therapists, psychologists, outreach and faith-based and others) that are easy to use and integrate into existing community residential, intensive outpatient and outpatient substance use disorder treatment facilities, as well as school-based counseling, faith counseling and other helping professional and faith-based groups. Provide an effective, cost-efficient, feasible model for improving clients’ conflict resolution capacities. This innovative program is based on concepts adapted from effective use in other disciplines/environments, make use of today’s technology, and enhance relapse-prevention options. Provide almost 400 PowerPoint slides to use in therapy or psychosocial educational sessions. The Facilitator's Guide features talking points, exercises and role plays that focus around the course themes, as well as tips for interacting with groups and individual/family/couple clients around substance abuse conflict resolution issues, visual aids, and evaluation forms. The Participant's Guide outlines key concepts, provides visuals that reinforce content, and includes homework assignments and personal exercise sheets. 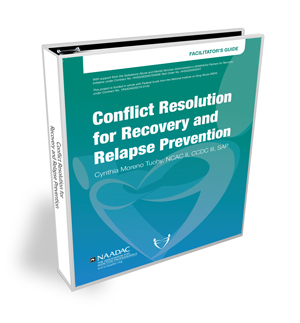 The Conflict Resolution for Recovery and Relapse Prevention Training Kit consists of the 264-page Facilitator’s Guide, the 99-page Participant's Guide, and a CD-ROM with almost 400 PowerPoint slides to use in therapy or psychosocial educational sessions. This purchase includes the 264-page Facilitator’s Guide. This does NOT include the Participant’s Guide or the CD-ROM. This purchase includes the 99-page Participant’s Guide. This does NOT include the Facilitator’s Guide or the CD-ROM. 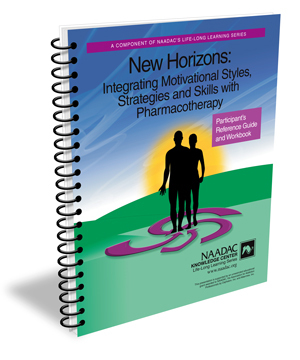 NAADAC's New Horizons: Integrating Motivational Styles, Strategies and Skills with Pharmacotherapy is designed to educate participants on various motivational approaches to help persons with alcohol use disorder make positive behavior change in their lives. This educational program will discuss how addiction counselors and other helping professionals can utilize a motivational style in addiction treatment, as well as how to integrate appropriate motivational strategies and skills to help persons with alcohol use disorder move through the Stages of Change. This educational program will provide an introduction to open-ended questions, reflective listening, affirmation, summarizing, eliciting change talk, asking permission, giving advice, providing a menu of options, rolling with resistance and the four FDA-approved pharmacotherapies for alcohol use disorder. Discuss the integration of motivational styles, strategies, and skills into counseling persons with alcohol use disorder. Recognize the differences between the four FDA-approved pharmacotherapies for substance use disorders. Review the Stages of Change model and how to utilize motivational approaches at each Stage. Apply knowledge presented during the educational seminar in group exercises and role plays. Discuss methods to overcome treatment obstacles and matching clients to the most appropriate therapy. Translate information presented during the educational seminar to clients, families, and colleagues. This purchase includes the 149-page manual, CD-ROM and an online study exam that can be completed for 15 nationally-approved continuing education hours. This purchase includes the 149-page manual and CD-ROM only. This does NOT include access to the online study exam that can be completed for CEs. 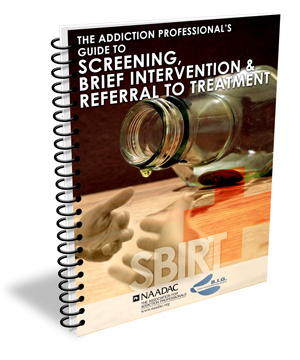 The Addiction Professional’s Guide to Screening, Brief Intervention & Referral to Treatment is a 175-page skill-based training program that brings together the tools that addiction professionals need to screen clients for unhealthy drinking, deliver effective brief counseling, refer to other specialists and provide successful case management & follow-up. This educational program also provides numerous appendices, resources, worksheets and specialty topics such as: understanding the dynamics of the families with alcohol use disorders in order to support both the family members, as well as the client, with alcohol-related issues; assessing and treating older adults whose use of alcohol or prescription pain medications may create additional complications; assessing and treating young adult and adolescents whose drinking patterns are unhealthy; and connecting clients to mutual support groups. This purchase includes the 175-page training manual and an online quiz for 18 nationally-approved continuing education hours. This purchase includes the 175-page manual only. This does NOT include access to an online exam that can be completed for CEs. 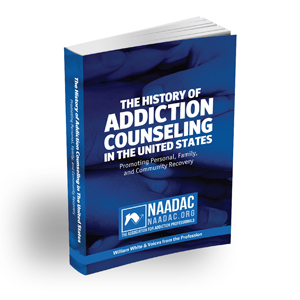 To celebrate its 40th Anniversary, NAADAC is excited to announce the release of The History of Addiction Counseling in the United States: Promoting Personal, Family, and Community Recovery by William L. White, documenting the history of addiction counseling and NAADAC's role in the profession. Since its inception, addiction counseling has operated without a definitive history of its birth and evolution. Recognizing the need for such a history, NAADAC recruited William (“Bill”) White, the addiction field’s premier historian and author of Slaying the Dragon: The History of Addiction Treatment and Recovery in America and related historical texts, to use the NAADAC archives and voices from the field to construct the history of addiction counseling and NAADAC's role in that history. We offer special thanks to all those who collaborated with Bill to make this book a reality. It is our hope that this text offers a fitting tribute to the elders who have gone before us, celebrates this generation of addiction professionals, and invites future generations into this esteemed arena of service. This purchase includes the 521-page book. 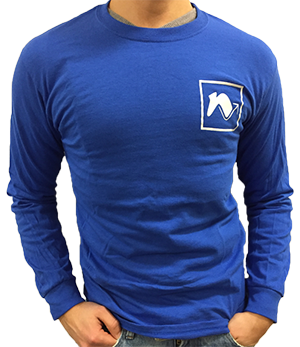 Let others know you’re proud to be a NAADAC member & addiction professional who’s improving the lives of your clients with the 100% heavy cotton long-sleeved NAADAC t-shirt. 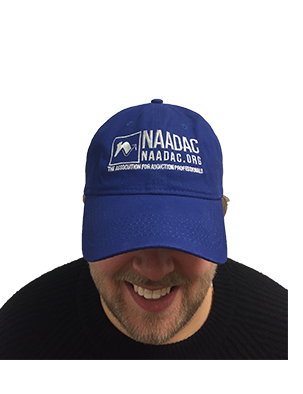 Whether you wear it to keep the sun out of your eyes or to show your NAADAC pride, the NAADAC embroidered baseball cap is a solid addition to your wardrobe. 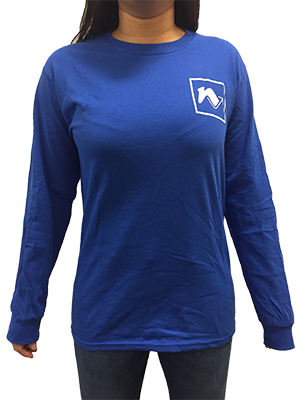 Made by Port & Company, its material is durable yet soft. 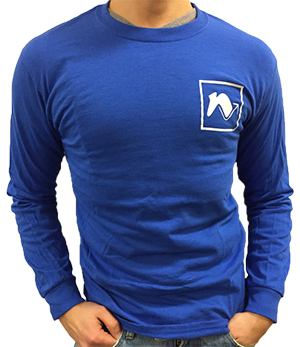 With an easy-to-adjust back, it can fit any sized head. 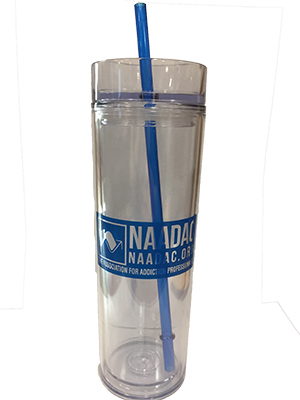 Stay hydrated & spill-free with the NAADAC plastic tumbler. It’s easy to clean and fits in your car’s cupholder! The person who’s organized and in charge is the one usually holding the clipboard. 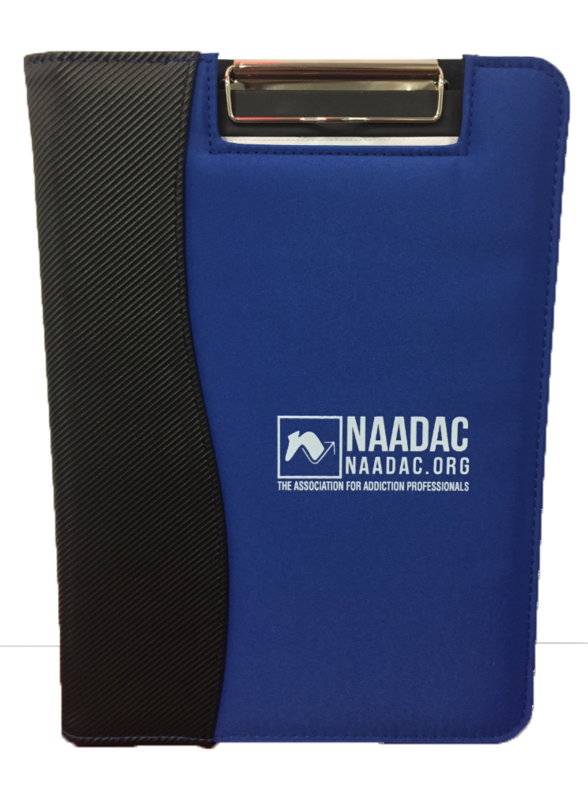 Be that person with the NAADAC portfolio’s padded front and back protective layer, reinforced soft plastic spine, and interior pocket.